In Defense of A Liberal Education describes the differences between the traditional American model of liberal education, in particular the core curricula of institutions such as the University of Chicago, and the differences between this model and university education in comparable countries, such as England or Germany. The book also describes conservative critiques of the traditional model, which claim that universities might better serve the nation by focusing on technology and science training. If we are to defend liberal education, then we might open a discussion about how we define this traditional model, given the unique history of the humanities and social sciences in this country. We might also recognize the high degree of variation in this traditional American model, from the core curriculum of universities such as Chicago to the open curriculum of universities such as Brown. In short, what model of liberal education do we seek to defend? Much of the book sets up a dichotomy between the critique of liberal education—from government and media—and the liberal educators. It also suggests that there are deeper issues pertaining to social, cultural, and economic changes across the globe, that we need to take into account if we are to rethink or defend a liberal education. But the book does not explore those issues. Instead, it largely compares a 1950s model of American liberal education to current circumstances, in which politicians and university administrators are cutting funding for humanities programs and speaking against the “social value” of disciplines such as anthropology, art history, and philosophy. We might discuss the changing economic and cultural landscape in North America, and how this is affecting a liberal education. For instance, in contrast to the 1950s model, a college education is now necessary for many kinds of employment and, on the other hand, one cannot make a middle-class or lower middle-class living wage working in most jobs that do not require a college education. We could identify many other economic changes, and we might discuss how we can rethink and redesign a liberal education relative to these challenges. Is a liberal education a thing to be defended? Or should our “defense” be to rigorously state that a liberal education is an absolute necessity, a social value for the good of the nation? If a liberal education is a social value, then it cannot be assessed according to economic measures. Should this even be a subject of debate? In making this defense of liberal education, we are supporting the argument that this is and can be a debate instead of supporting the idea that a liberal education is an absolute necessity, and should not even be the topic of debate. We could perhaps shift the terms of the debate, recognizing the critique of liberal education, the transformation of American education (college is now necessary for job placement), and the changes in university curricula. Too often university professors fall into the trap of reiterating the market-based measures of value that the conservative critique uses to devalue a liberal education. That is, they claim that many disciplines do not provide the right kinds of jobs that work to fuel the economy, and so they state that these disciplines are not necessary. Universities and professors counter this claim by pointing out that these disciplines provide students the skills—from critical thinking to clear writing—that they need for a variety of jobs. But, in making this counter-argument, we are playing into the rhetoric. We are implying that education and critical thinking can be measured according to economic values. We might discuss how we can shift the terms of the debate by redefining “value” itself. A liberal education yields a social value that cannot be quantified or reduced to numbers. We could best defend a liberal education by recasting the debate in terms of social value—we want to live in a society of critical thinkers, respectful debaters, and innovative designers (whether these forms of thinking, debating, and designing “pay” or not). In this regard, we might critically discuss how academia’s obsession with quantifying and assessing education is, implicitly and unintentionally, playing into the rhetoric of our detractors—by attempting to quantify critical thinking and represent education in terms of percentages of goals achieved, we are reducing a liberal education to an economic sense of value, measured in terms of abstract numbers that do not represent social values. 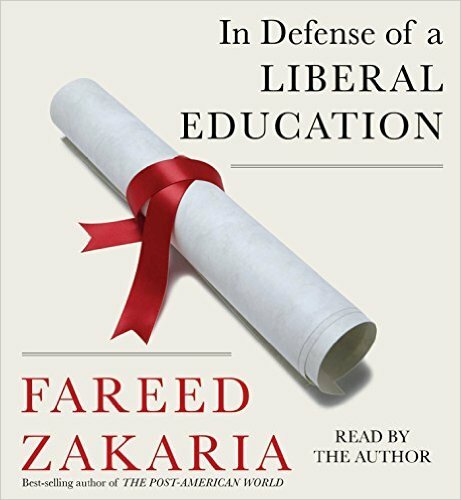 Fareed Zakaria’s In Defense of a Liberal Education is the focus of this year’s Common Book Experience. Download your copy through the Self Service app on your iPad.